Adeputra was born on the 31st of December, 1970 in Batu Pahat, Johor. 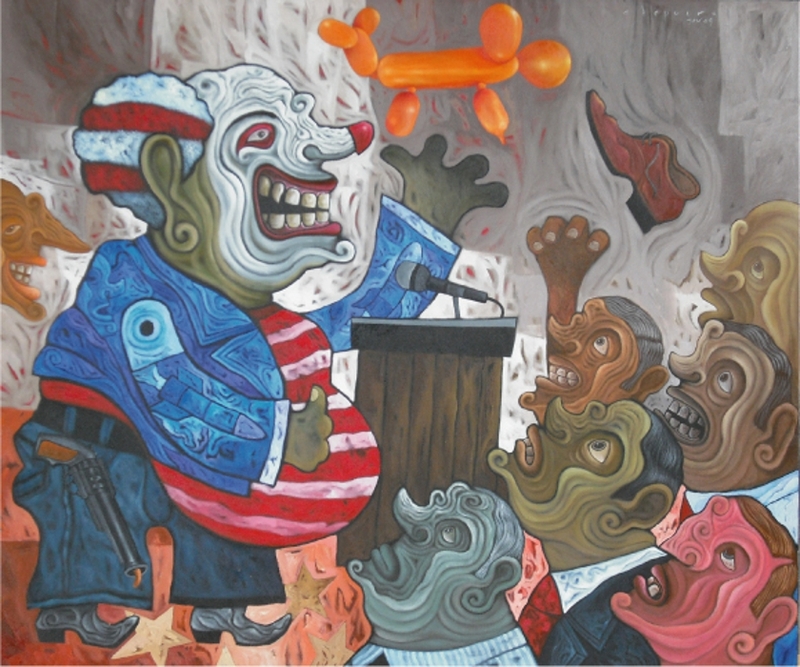 Before going full time in 1996, his involvement was mainly caricature works. He was a cartoonist and illustrator for a publishing house from 1989 to 1992. After which, he was employed by Utusan Malaysia until 1995. Ade's early works are about searching his identity and expression. He was obsessed into this quest and eventually realised that the best way is to let his soul do the searching with his lines and colours. Ade said " The quest for individuality in expression is an endless journey. It is not a mission of perfection but allowing free evolvements in it." The actual search is not about differences but similarities. These qualities bring out the feeling of togetherness and love in my soul." After going through a few stages of developments, experiences and observations, his works progresses through shapes and techniques. "To me, art is my spiritual expression within. Just like the artist's progressive life and movements, creative arts requires changes too. I am not looking for point of stability in my works. It must progress and improve with age and experience." 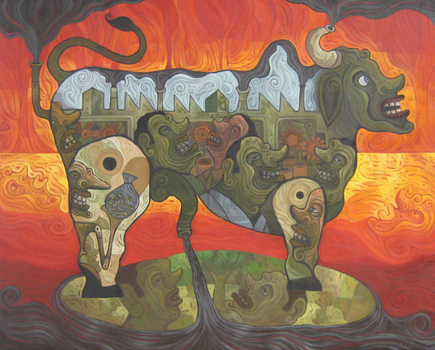 It is therefore obvious that within a short span of years, Ade's works clearly travels and progress through his mediums, techniques and ideas. But most importantly, his inclinations towards urbanizations as his conversation subjects are constantly maintained. In fact this one identity brings about stability in his artistic involvement till now. A good artist will be able to transfer his circles of environment and surroundings to canvas. 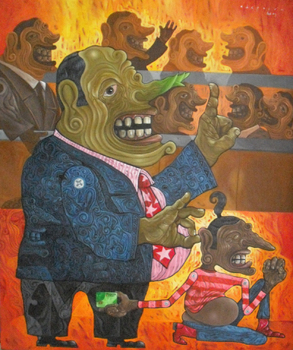 And it is obvious that most of his works are his daily expressions and experiences of his challenging life in metropolitan Kuala Lumpur. The usage of bold and bright colours for imaginative subjects are his identities. He favors the idea of arranging characters and subjects according to their importance. Eventually creates interesting presentations as these are his stories which are easy to understand. He feels that life in the city gives him the freedom of expression within the law, human rights and unfortunately a lot of human hierarchies as well. Every life will have to digest this reality of life. His works will always communicate symbolically and sarcastically towards everyone on the street. As a result, his artworks carry values of life, nostalgic characters and fresh inspirations to the audience. His informal artistic background gives him unlimited space to explore. 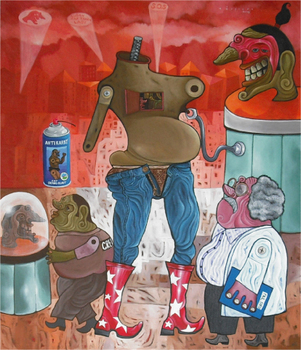 Unlike most academically trained artists, Ade is not confined to certain styles and streams of works. He is a true artist who paints through his in born talent from his natural spiritual self. He has his own views about his life. " We live with our mind. The ability to deliver results will not depend on luck or intelligence. But it all rely on the ability to produce ideas and make it happen." The formal education to him is only a process of updating subjects so as to develop and expand. This is a result of civilization. But in reality, the ability to think and deliver is always a priority. With or without formal education, the competition in life will always directed towards a similar goal. Holding tight on these principles, Ade is moving on hard in the Malaysian artistic arena. He is ambitious about success and good achievements in the future. 2000 - Design for Pediatrics Ward wall decorations (volunteer project) . Hospital Seremban, Seremban. 1999 - Design for Pediatrics Ward wall decorations (volunteer project) - HUKM Cheras, Kuala Lumpur.